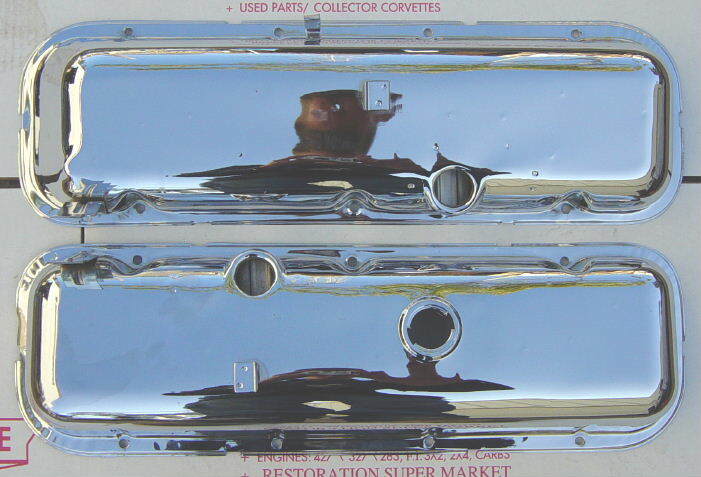 These are the only Restoration Big Block Chevy Valve Covers made in the U.S.A. - all others are China, Taiwan, Malaysia, Singapore or one or more of the above, and totally non-fitting Incorrect dog crap. 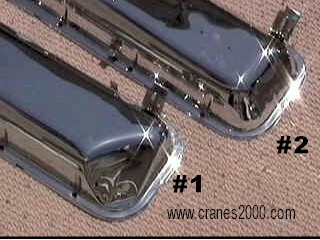 These are the only one's "Made in U.S.A.
CRANE’S - HAS BEEN MANUFACTURING ALL " 14" TYPES -OF BIG BLOCK VALVE COVERS SINCE 1989. .... as seen on All the National Level show winning Camaros and Chevelles, and Nova's as well as Corvettes. Chevy VetteFest Nationals, Chris Daniels Restorations, "Bloomington Gold" and NCRS top flight cars and Camaro and Chevelle Nationals show cars !! Exacting in all details - even with the draw lines , the projection welds that pop-up from the drip-rails and correct stands and wire clips. 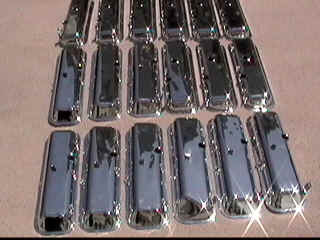 VALVE COVER 427 RETAINERS AVAILABLE IN QUANTITY...100 ‘s AVAILABLE ..CALL...fasteners, grommets, spark plug clips. Below is a 1971 L.H fully detailed. all photos are © and property of Crane's Corvettes. 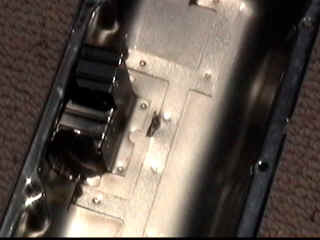 Below is a close up of the Exact 1967-69 "CAMARO" Big Block valve cover with Correct Brackets/flanges/nub. NOTE: THE TALL BENT BRACKET IS MOVED FORWARD OF THE BOLT HOLE FOR FIREWALL/wiper motor CLEARANCE.- Correct according to the National Camaro Judges. There are 3 versions on the clip locations depending on the year. 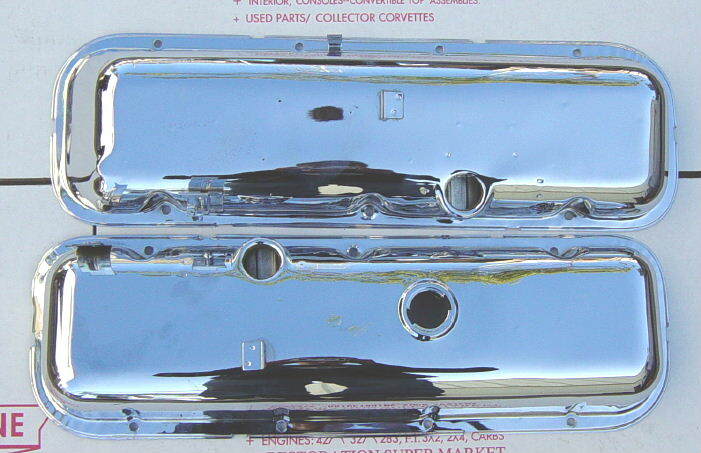 Below is a close up of the Exact 1968-69 CORVETTE Big Block valve cover with Correct Brackets/flanges/nub. *SPECIAL HI-PERF HAS DRIPPERS etc. 4 *1970-74 ALL. –RAKED EVENLY WITH SMALL CREASE AT BOTTOM. All Corvettes, Camaros, Chevelles etc. 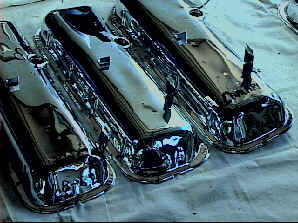 HAD POWER BRAKE VALVE COVERS with or without the PB option. #V65-6CP=== 396-427 CHROME- Z-16 CHEVELLE AND 66 ALL CHEVELLE396/427 AND PASSENGER CAR 396/427-UNIQUE POWERBRAKE CORNER SHAPED-SIZE OF A U.S. SILVER DOLLAR. CAMARO-NICKEY & BILL THOMAS, MOTION CHEVELLE, CAMARO.etc. W/ TALL BENT BRKT MOVED TO FORWARD LOCATION .USED ON ALL C.O.P.O & ZL-1 & L-89 CAMAROS/ NOVA-NICKEY AND BILL THOMAS, CAMARO/NOVA. V69P-CC = 1969 CAMARO CHROME- DRIVER SIDE HAS ONE CLIP ON EXH. SIDE FOR TEMP WIRE. Also: 283 & 327 originals available steel &finned aluminum..call 800-597-4132.
w/the 4 individual spark plug wire clips on the side. 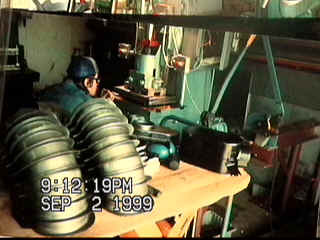 CRANE MANUFACTURING INC.-- 600 Ton press == "MINI - TERMINATOR "